Everyone needs a HERO! 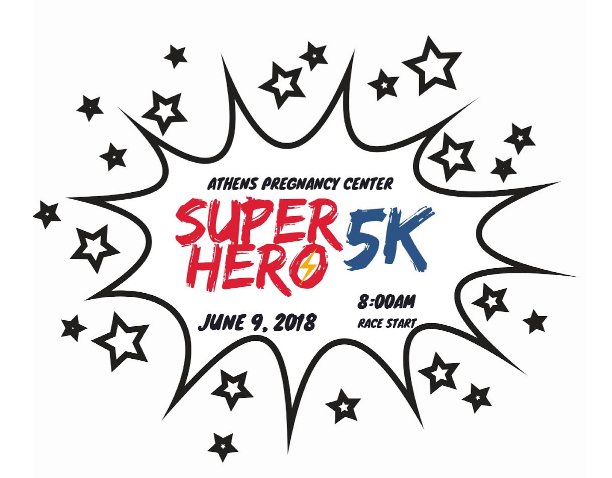 This is your chance to be a superhero for Athens Pregnancy Center! Grab your costume and run, walk, or fly with your family to the 2018 APC Superhero 5K in Athens, GA.
A photo booth with all kinds of superhero props will be set up. A photographer will be on site to help you take great pics of you with your friends or family! Selfies are welcome, too! Enjoy the day and make great memories! Awards: Overall and Masters, first, second, & third place in age groups, 10 & under, 11-12, 13-15, 16-19, 20-29, 30-39,40-49, 50-59, 60-69, 70 and over. Shirts and Goodies: Shirts are guaranteed to those who register by 5/31/18. Those who register after that date and on race day are not guaranteed a shirt or size. There will be plenty of refreshments.